These easy Halloween cupcakes are both fun to make and delicious eat! This post has plenty of ideas on how to decorate your cupcakes for Halloween and a simple cupcake recipe. Other cute and easy Halloween treats to try are these Halloween Truffles or Halloween cookies. Or try some savory Halloween foods, including these monster meatball sliders or these cheesy bread fingers. Happy Halloween! If you’re looking for a festive last minute Halloween treat — these are the cupcakes to make. The base takes minutes to whip together and the decorating is very simple to do. The base of these cupcakes are chocolate-walnut. I love adding nutritious, heart-healthy foods to desserts, and I LOVE what walnuts do for these cupcakes. They enhance both the flavor and the texture of the cupcakes, while also offering good fats (13g/oz polyunsaturated and 2.5g/oz monounsaturated fat), protein (4 g/oz), and fiber (2 g/oz). 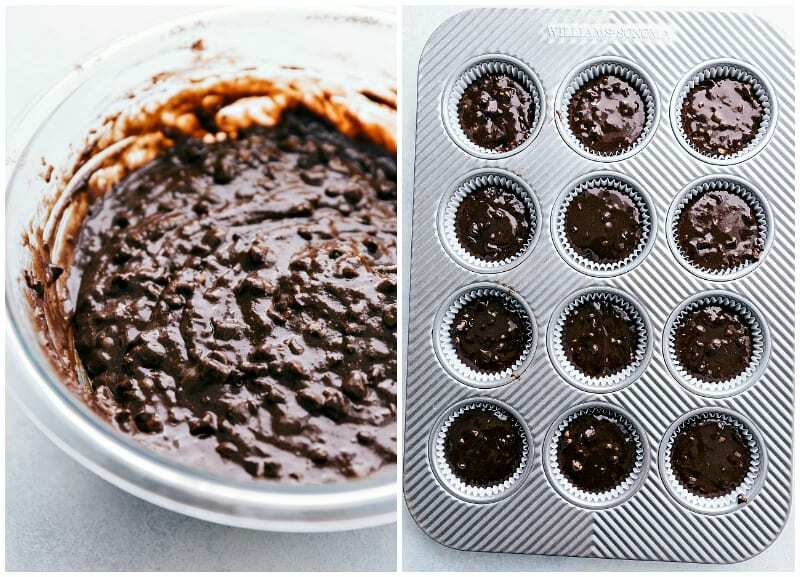 How do you make easy chocolate walnut cupcakes? 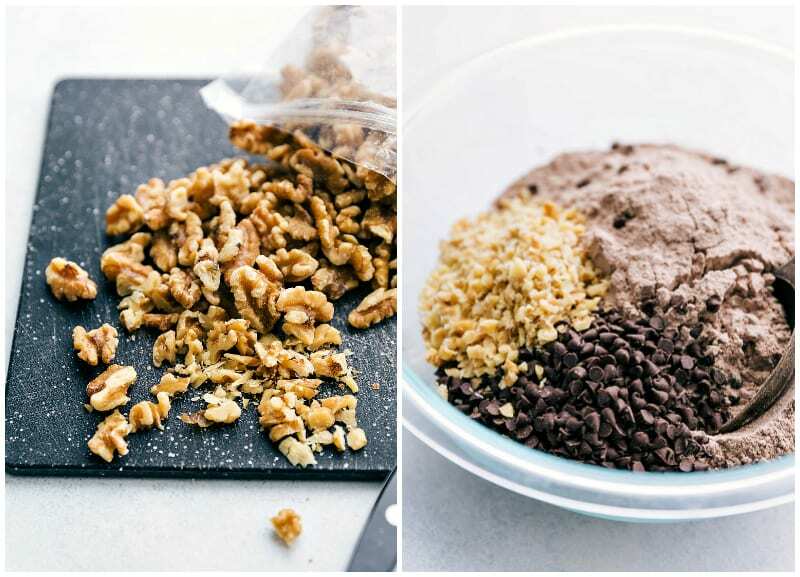 Chop the walnuts – while you don’t want them to be too small, they need to be small enough that the batter can support them and they don’t go straight to the bottom. Coat the walnuts – another important step to prevent the walnuts from sinking to the bottom is first coating them with the dry ingredients. This helps them to better incorporate into the cupcake batter. Have a thick cupcake base – the last secret to the perfect chocolate walnut cupcakes is to have a thick cupcake base. The pudding and sour cream in this cupcake recipe help with that, and will again prevent the walnuts from sinking to the bottom. 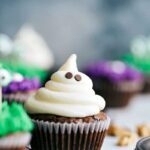 Ghost cupcakes – Pipe the cream cheese frosting onto the cupcake in an upside-down cone shape. Place two mini chocolate chips near the top of the frosting for the eyes! 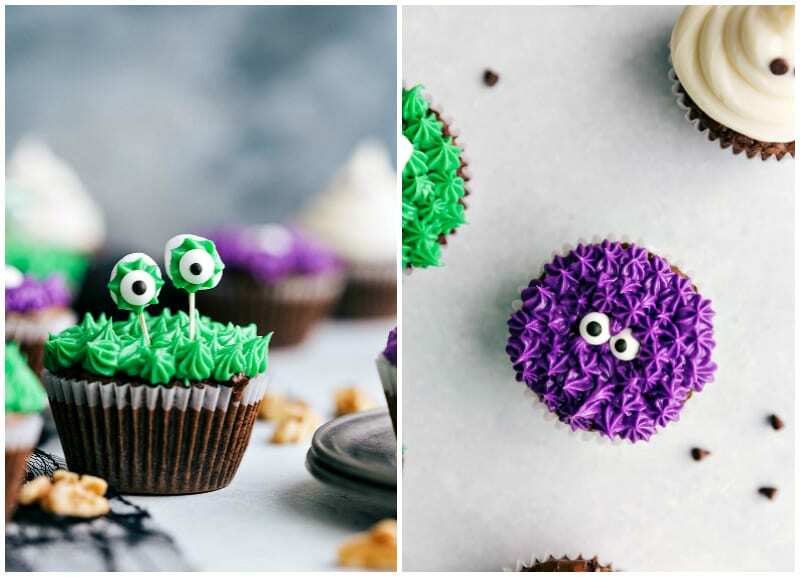 Monster cupcakes – Pipe the purple or green frosting on the cupcakes and decorate with edible eyes. To add another element — you can attach eyes with a toothpick and mini marshmallows. Attach an edible eye to the marshmallows with frosting. Other ideas – Another fun idea is to use some of my other Halloween treats as cupcake toppers to create the ultimate Halloween cupcakes! Use the cupcake as a base, and stick one of these adorable Halloween Oreo pops in them. For some creepy Halloween cupcakes that couldn’t be cuter, place one of these Halloween Oreo truffles on top! What supplies do you need for these Halloween cupcakes? Most of the ingredients for these Halloween cupcakes are regular staples that you most likely have in your pantry. However, there are a few things you may need to grab in order to decorate these! Edible candy eyes – these candy eyes are what really make these Halloween cupcakes so cute. You can find edible eyes in most grocery or craft stores. They are typically found with cupcake/baking supplies in either store. Food dye – you’ll want to get purple and green food dyes for the monster cupcake frosting. Again, you can find food coloring in most grocery or craft stores. Frosting tips and piping bags – a variety of frosting tips and bags makes decorating easy and allows you to get creative! For the monsters I use a #17 tip. You can also use #18 or #22 tip and for the ghost a plain #24 piping tip. Preheat the oven to 350 degrees F and line a cupcake pan with liners. Set aside. In a large bowl, whisk the eggs with a fork. Add in the sour cream, canola oil, and vanilla extract. Stir until completely combined. In another large bowl, add in the cake mix and pudding mix. Stir. Add in the chocolate chips and walnuts and stir until they are lightly coated in the dry ingredients. Add dry to wet. Add in the water and mix until just combined. Fill cupcake liners 3/4ths the way full (batter should yield 24 cupcakes). Bake for 18-23 minutes or until a fork when inserted in the center of a cupcake comes out clean. Remove and allow to completely cool before frosting. Meanwhile, prepare the frosting. Using a hand mixer, cream together the room temperature butter and cream cheese on medium-high speed until completely smooth. Mix in vanilla extract and sea salt. With mixer running on low speed, slowly add powdered sugar and beat until well blended and smooth. Chill the frosting while the cupcakes finish cooling. 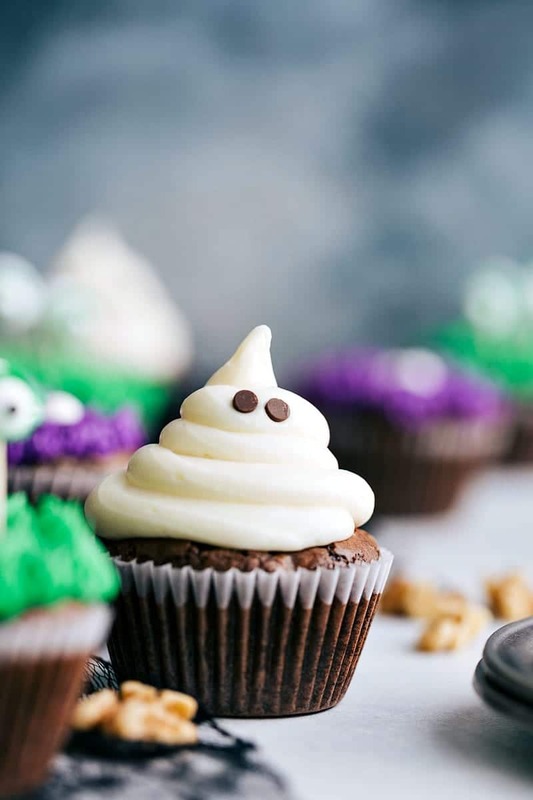 Frost completely cooled cupcakes with cream cheese frosting and decorate to look like Halloween creatures: FOR THE GHOST: Pipe the cream cheese frosting (using a plain #24 piping tip) onto the cupcake in an upside-down cone shape. Place two mini chocolate chips near the top of the frosting for the eyes! FOR THE GREEN MONSTER: Dye the cream cheese frosting green and using a #17 tip create short quick actions (while applying pressure) to add “fur” to the cupcake. Add edible eyes wherever you want on top! FOR THE PURPLE MONSTER: Dye the cream cheese frosting purple and using a #17 tip create short quick actions (while applying pressure) to add “fur” to the cupcake. Using the frosting, pipe a short action on two marshmallows and attach 2 edible eyes. Using toothpicks, attach the marshmallows to the cupcakes. Halloween cupcakes best enjoyed within 1-2 days. This post is sponsored by the California Walnut Board. All opinions are my own.